CHANDLER, Ariz. – Feb. 21, 2017 –Demand for the Bondurant’s Fiat Trackside experience featuring the Fiat 124 Abarth Spider and 500 Abarth was so strong that the inaugural event was sold out when it opened on Friday, Feb. 10, 2017. The public clamored for the unique high performance driving experience and professional instruction in the nimble Fiat cars. Bondurant’s Fiat Trackside program is a part of the legendary Bob Bondurant School of High Performance Driving, offering driving enthusiasts an opportunity to develop their racing and driving skills. Bondurant’s Fiat Trackside Experience is offered as a multi-day program that features classroom and trackside instruction, as well as a road rally along scenic Arizona highways. The classroom instruction familiarizes students with the Fiat brand and performance line up. Students then enjoy an afternoon on the track in the 500 Abarth and 124 Spider Abarth. The instructor-led trackside program includes heel-to-shifting, slalom, auto-cross, team rally cross lead and follow and hot laps. The optional second day features a spirited drive stretching almost (200) miles through beautiful Arizona roads. 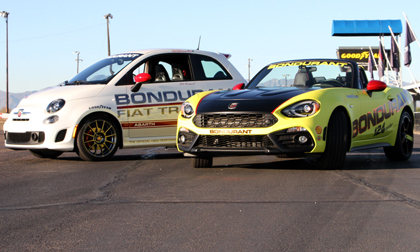 Bondurant’s Fiat Trackside experience, which features the Fiat 124 Spider Abarth and Fiat 500 Abarth, is a perfect program designed for drivers of all skill levels. It can be used to help new drivers become more comfortable behind the wheel, or give experienced ones the chance to push their comfort levels. It can be part of corporate events and team building activities, as well as private gatherings. From high performance driving classes to racing preparation and law enforcement training, Bondurant has a program that improves skills for anyone. To learn more about Bondurant Racing School please call 1-800-842-7223, or visit www.bondurant.com. The Fiat Trackside and Road Rally features two days of driving excitement featuring the Fiat Abarth 500 and the Abarth 124 Spider. Classroom instruction familiarizes students with the Fiat Brand, while hands-on trackside instruction helps improve and fine tunes driving skills. The optional second day Road Rally gives drivers the opportunity to experience the performance and handling of the Abarth models along a stretch of nearly 100 miles of scenic Arizona highways. For more information visit www.FiatTrackside.com. In North America, the Fiat 500 was introduced in March 2011 and was soon followed by the Fiat 500c (Cabrio), the high-performance Fiat 500 Abarth and AbarthCabrio, the fully electric Fiat 500e, the five-passenger Fiat 500L and the all-wheel-drive 500X crossover. The FIAT brand continues to expand with the introduction of the Fiat 124 Spider, a revival of the iconic roadster that combines Italian style, performance and engaging driving dynamics. The all-new Fiat 124 Spider is available at FIAT studios now. The Bob Bondurant School of High Performance, which is located in Phoenix, Ariz.., is the only purpose-built driver training facility for performance enthusiasts and is the largest driver training of its kind in North America. At the heart of the 60-acre facility is a 1.6-mile, 15-turn multi-configuration track that was designed by Bob Bondurant. The school maintains over 200 race-prepared vehicles, sedans, SUVs and open wheel cars. For more information, visit www.Bondurant.comor call (800) 842-7223.